Hi there! Could you tell me from where the sliding door is sourced? Hi Emily, I wish I knew to be able to tell you. We specified Capral Commercial Suite frames with double glazing for these windows - in Woodland Grey powder coat finish. Tricky window and door situation – what do you think? @MelN. I know what you are saying. its easier to advise someone becouse we don't have to live with the consequences of wrong decision, we just give opinion. when it comes to making decisions in my place I take ages. Last 3 years I have been getting quotes for new window dressing and still I am not closer to a decision. I feel for all the people out there renovating, its costly in more than one way and in the end hopefully they are happy with the results. the whole house needs attention, Me and my youngest daughter with her Three Boys, live together in a Three bedroom one lounge and one toilet / bathroom, yes we are renting, through housing department, yes the rent is convenient as we pay a minimum of a quarter of our income, just need a better laid out house design with the toilet being a separate room with an extra toilet thrown in, in the laundry area, yes we are blessed to have a roof over our heads, we live in NSW, Australia. Hi Jiminico, I'm not known for my photography skills! I took these this morning as I was running out the door. Excuse the visual clutter! The screens are stacked back (not all the way)- so you can get an idea of the size of the opening when all is stacked back. 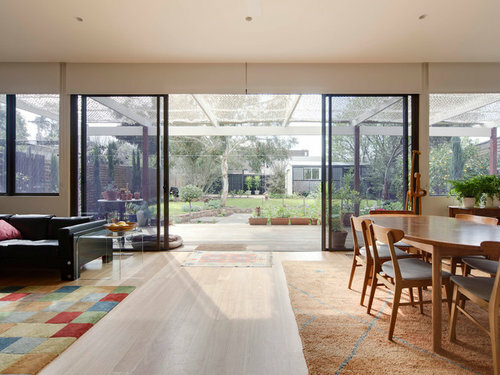 To have bifolds here would of meant 4 panels (lots of frame and less glass), then the encroachment of the panels into the room when they are folded back.